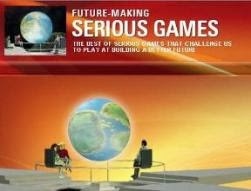 This year´s Games for Change Europe Festival, held June 15-16 at the CNAM Museum in Paris, France, dedicated a series of talks to games that promote emotional and physical health. According to G4C organizers, studies suggest that intuitive interfaces, virtual reality and compelling game design will soon help shape new therapeutic methods in tackling society´s health challenges on a broader scale. 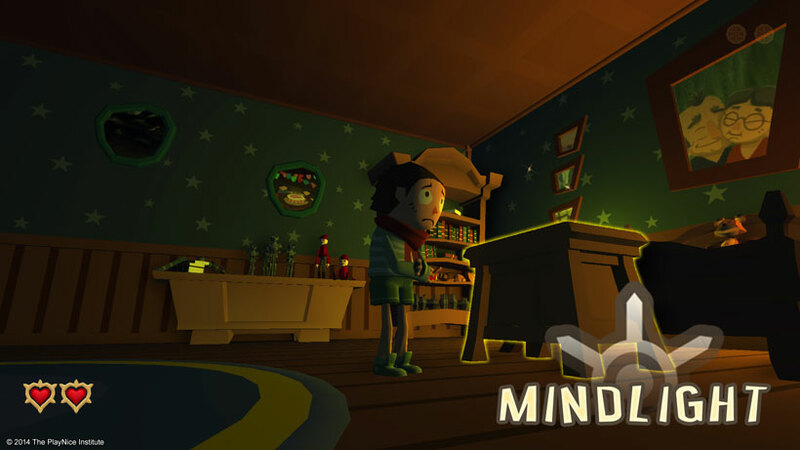 Isabela Granic, CEO of The PlayNice Institute, presented MindLight, a Serious Game aimed at 8-16 year old children that suffer from anxiety disorders. Anxiety is the most prevalent form of children's mental health problems and demand far exceeds treatment availability. Even when children do have access to care, evidence-based treatments such as cognitive-behavioral therapy have several limitations: they are largely didactic, leaving children unmotivated and disengaged; children get little practice in using the skills they are taught, creating a large gap between their knowledge and their everyday behavior and therapy is costly, often prohibitive for the children that most need it. 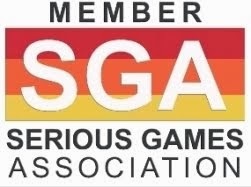 Therapeutic video games can address each of these gaps: they are engaging contexts through which children practice skills (rather than memorize lessons), and they cost substantially less than conventional approaches. 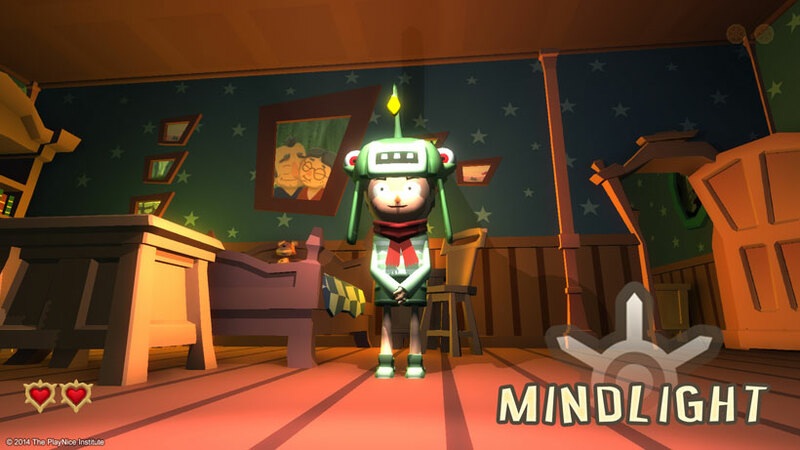 MindLight incorporates several evidence-based strategies including relaxation and exposure techniques, attention bias modification methods, and neurofeedback mechanics that together produce an immersive game world through which children learn to manage and overcome anxiety symptoms. 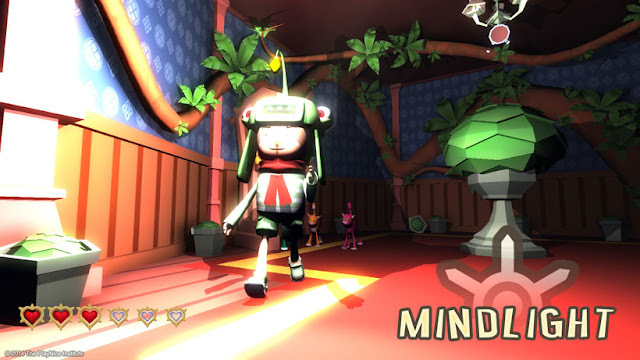 It is a result of the collaboration between The PlayNice Institute, with its ongoing research program in partnership with the Developmental Psychopathology Department at Radboud University Nijmegen, and game developers at GainPlay Studio, who are pioneering the creation of biofeedback games for impactful play. 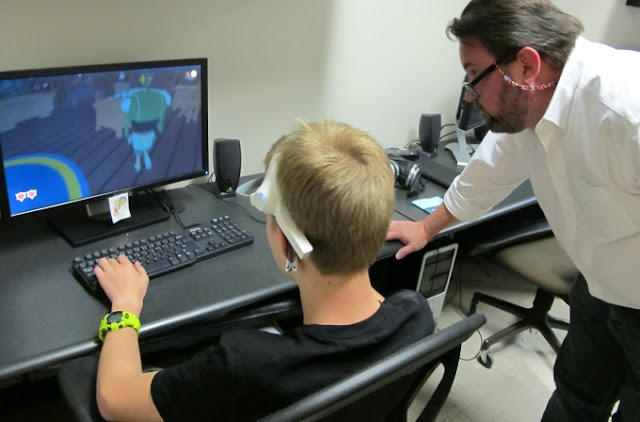 Players wear a neurofeedback headset, NeuroSky’s MindWave, that measures their level of relaxation or anxiety and that information is incorporated into key features of gameplay. Developers’ working hypothesis is that after many intense experiences of remaining calm in threatening situations, children develop healthier habits of mind. 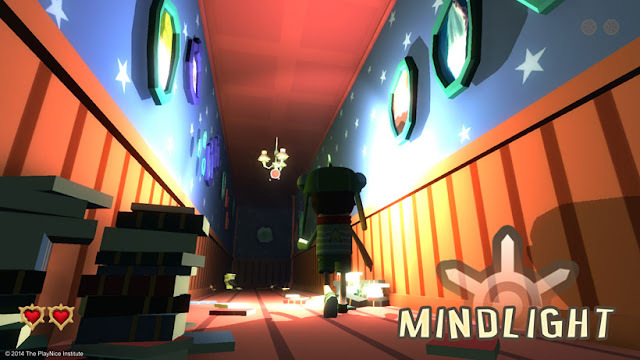 They learn to manage their distressing emotions through immersive, engaging gameplay. They believe that it is this in-game practice that canalizes new neural pathways and these new pathways may be the means by which playing MindLight forms resilient habits of mind that transfer to children’s everyday lives. The PlayNice Institute’s ongoing research program has been testing these hypotheses through systematic randomized controlled trials and carefully controlled experiments. In the game, Little Arthur is left on the doorstep of a scary mansion by his parents. He finds a glowing headset that introduces himself as Teru, the Magical Hat, and warns Arthur that his grandmother has succumbed to shadows. Only Arthur, with the help of the Hat, can bring her back. But to do this, first Arthur must learn to use his own powerful mind to overcome his greatest fears. 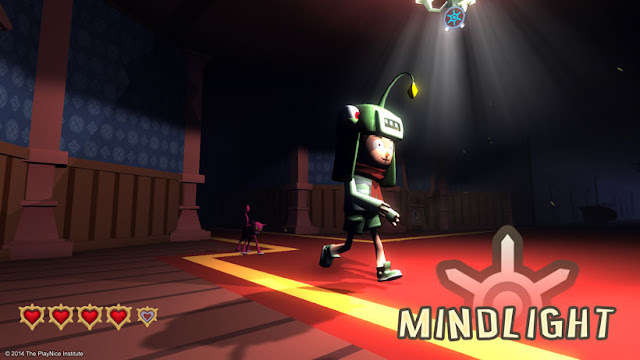 Through simple (at first) puzzles and relaxation techniques, Teru teaches him how to use his “MindLight.” Through these lessons and increasingly difficult puzzles and “fear events”, players learn that they can overcome their fear and anxiety by tapping into the power of their own mind. Based in Utrecht the Netherlands and formerly known as Dreams of Danu, GainPlay Studio creates Serious Games that incorporate biofeedback from a user centered point of view. They use bio- and neurofeedback to help them understand players and find fitting solutions to design challenges. Using real-time emotional and cognitive feedback we refine games towards our goals to deliver a motivating and insightful gameplay experience. The PlayNice Institute is a non-profit organization that focuses on the design and development of games that promote emotional resilience through skills acquired while children are immersed in games they love to play. The PlayNice Institute promotes a radical shift in mental health approaches for children through game-based interventions as the “next generation” solutions.